From this weeks episode of Teekyu (episode 106!). 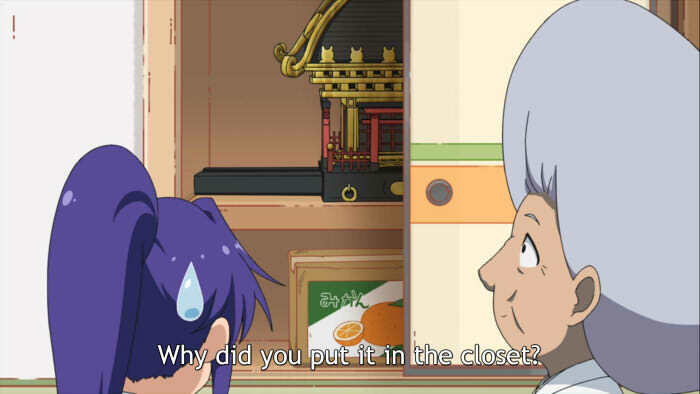 The dialogue is actually referring to the shrine, rather than the box, coincidentally. This isn’t the first time Teekyu has popped up for this, and I’m pretty sure I skipped over one I could probably have gotten away with appearing in one of the OP sequences because I try to avoid too many series duplicates, but I had just recently been thinking that it’d been a while since I’ve posted one of these. Teekyu has been off-air for a while. Presumably this is because director Shin Itagaki has been busy with other things – I mean, he was involved in that Berserk anime that was broadcast the last couple of years, and he’s the director on the new Wake Up Girls show that is starting next month, which has no doubt been keeping him pre-occupied for some time now. I dare-sent say, as much as I love Teekyu, maybe the break was needed – the current season of Teekyu has been way more consistently on-point than the last couple of seasons were. That said, maybe it’s just the whole absence-makes-the-heart-grow-fonder thing. Which is about all I have to say about Teekyu this evening.